Clearwater Engineering, Inc., is located in Clearwater, Kansas, about 10 miles southwest of Wichita where we have been a supplier to the aerospace industry since 1987. We are located in a modern, climate controlled, 24,000 square foot facility with plenty of room to grow! Clearwater Engineering has developed into a modern supplier that has the engineering and manufacturing capabilities to meet much of the industries needs in machining, assembly and integration. Clearwater Engineering provides state of the art NC Programming and engineering services including CATIA V5 & V4 as well as Vericut capabilities. We also utilize a highly capable MRP system called "Job Boss" that provides all the tools required for resource planning with shop floor scheduling, capacity planning, purchasing, inventory and material as well as vendor process orders, contract administration, engineering planning with multiple BOM levels for complex assembly and of course accounting. This management system combined with our AS9100:2004, Rev B and ISO9001-2000 compliant quality system provides the foundation needed for the effective management of a modern machine shop. Clearwater Engineering is focused on performance through process and market based management that utilizes the most advanced technologies in engineering, machining and integration capabilities. We know that our future success not only depends on our cost, quality and delivery performance, but on the value we place in our employees and the word we ultimately deliver on. 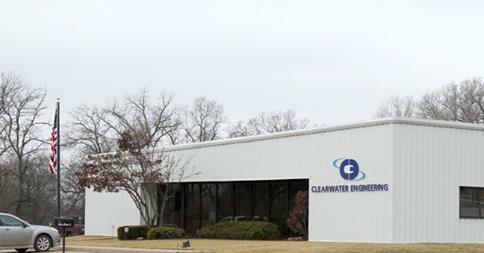 Clearwater Engineering is located on 11.2 acres in Derby's West End Industrial Park. Our modern 24,000 sq. foot facility includes 3,000 sq. feet of dedicated assembly. As we continue to grow with our customers we are prepared for an additional 120,000 square foot expansion!